The 11th edition of “The European Football Club” Report is available! 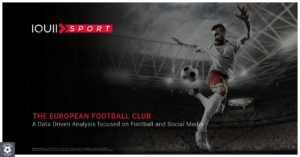 Are you ready to discover the news related to the social media of the main European clubs, sponsor brands and players? In the new update we have given even more space to the Sport Influencers. Indeed, after analysing the protagonists of Premier League and Ligue 1, it is now the turn of Serie A and Bundesliga: who will be alongside Cristiano in Italy? Do you expect to see a Bayern München’s supremacy in Bundesliga? Download now the latest update to know everything about the social landscape of European football, and don’t forget to share your favourite charts on Twitter with #TEFCReport, the official hashtag!